With the recent demise closing of McClelland, it got me thinking how prices will fare with the change in the landscape, and how the existing tobacco retailers and suppliers are handling the changes and how does the vintage tobacco market look today after the dust has begun to settle. Who better to help me figure out this new normal than Steve Fallon? 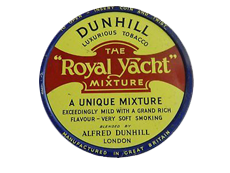 I sat down with Steve a.k.a “The Pipe Stud” and pulled up a pipe, and as usual, he offered to fill it with his mixture of vintage 1980s Dunhill Royal Yacht but only if he could include 5 brothers with this concoction. Don’t try this at home unless you’ve got a full stomach gang. Steve likes to see people turn green and giggle when you’re not looking. Lighting my pipe, gagging on the 5 brothers, I picked his brain on how he thought the market was heading. Don’t hate me because I smoked 50+ year old Escudo. It all started when finally, at the last minute, I convinced E. Roberts (a.k.a. "RomeoWood") to come to the Chicago pipe show. He’s a connoisseur of many fine things and has written several articles for this publication. We hung out together for most of the show. 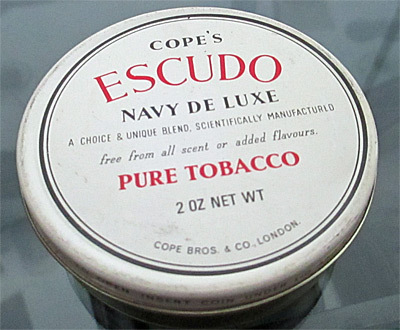 He brought with him a tin of Cope’s Escudo that he thinks is from the 1950s or 1960s, so it’s somewhere between 50 and 60 years old. Part of the plan was to crack this open on Saturday night and smoke it with Brian (Levine) and I.
Saturday night started with Bombay Sapphire Martinis, jambalaya, and mini-burgers, and ended with the depletion of a huge bottle of Woodford Reserve and several bowls of different vintage tobaccos. We had a great time hanging out with the Guss brothers, and then moved on to Bob Swanson’s room … and the next thing I remember is having quite a challenging time getting out of bed on Sunday morning.